You don't want any stickers but you'd like to support the cause. THANK YOU STICKER SUPPORTER! 3 unique sticker designs mailed to you MONTHLY (shipping included!) First time members will receive a free pin-back button as a thank you! **Stickers in this tier are HOLOGRAPHIC** An original, themed Magical Girl sticker and another magically themed sticker (2 total) delivered to you, monthly! Shipping included. Doubles of 3 unique sticker designs mailed to you MONTHLY (6 stickers total, shipping included) First time members will receive a free pin-back button as a thank you! 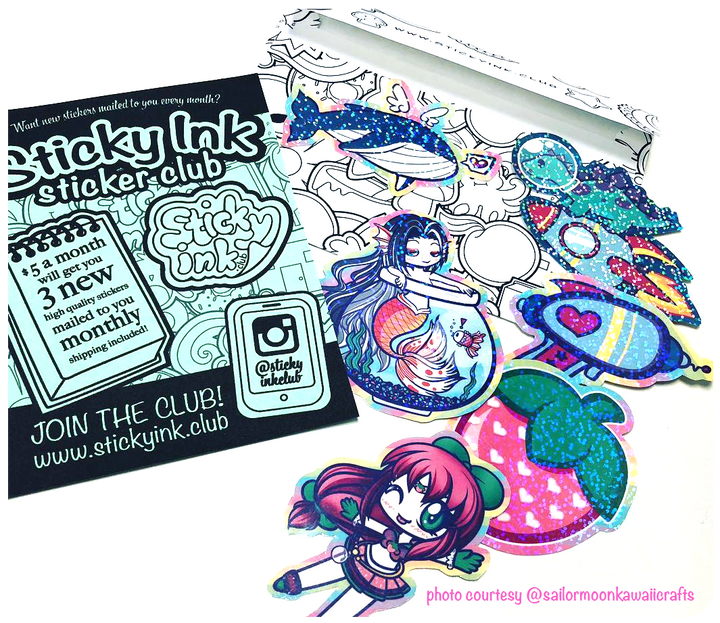 A combo pack that includes both the Basic Monthly Sticker Pack, AND the Magical Girl Pack (5 stickers total, 3 regular, 2 holo). Shipping included. First time members will receive a free pin-back button as a thank you! Once this goal is reached, we will hire on (or buy) stickers from another artist to contribute to the monthly sticker packs!